The name Kirklees was chosen by the merging councils from more than fifty suggestions, including Upper Agbrigg, Brigantia and Wooldale. It was named after Kirklees Priory, legendary burial place of Robin Hood, situated midway between Huddersfield and Dewsbury. The priory was located within the present-day Kirklees Park estate, most of which actually lies in the neighbouring borough of Calderdale. The name Kirklees is made up of the Scandinavian Kirk meaning Church and Lees meaning Meadows. Kirklees Council is the local authority of the district. The council is composed of 69 councillors, three for each of the borough's 23 wards. Elections are held three years out of four, on the first Thursday of May. One third of the councillors are elected, for a four-year term, in each election. The council is currently led by a Labour executive. Birstall and Birkenshaw, Cleckheaton, Spen. ^ "Ethnicity and National Identity in England and Wales 2011". National Statistics Online. Office for National Statistics. Retrieved 29 April 2015. ^ a b O'Leary, Patrick (8 August 1974). "Kirklees: Robin Hood brings the communities together". The Times. p. 12. ^ "In the footsteps of Robin Hood". History. Channel 4. Retrieved 14 February 2009. ^ "Map of Peak District National Park: Peak District National Park". Peak District National Park. Retrieved 29 June 2017. ^ "'Dewsbury should split from Kirklees'". Huddersfield Daily Examiner. 29 August 2007. Retrieved 29 June 2017. ^ "Tories announce plans to split district in two". The Press. Retrieved 29 June 2017. ^ https://web.archive.org/web/20070930033504/http://www.parliament.the-stationery-office.co.uk/pa/cm199192/cmhansrd/1992-03-09/Debate-6.html |archiveurl= missing title (help). Parliamentary Debates (Hansard). House of Commons. 3 March 1992. col. 717. Archived from the original on 30 September 2007. ^ https://web.archive.org/web/20070930033657/http://www.parliament.the-stationery-office.co.uk/pa/cm199394/cmhansrd/1993-11-22/Debate-8.html |archiveurl= missing title (help). Parliamentary Debates (Hansard). House of Commons. 22 November 1993. col. 277. Archived from the original on 30 September 2007. ^ https://publications.parliament.uk/pa/cm199091/cmhansrd/1991-05-08/Orals-1.html |chapter-url= missing title (help). Parliamentary Debates (Hansard). House of Collomons. 8 May 1991. col. 711. ^ https://publications.parliament.uk/pa/cm199596/cmhansrd/vo951204/debtext/51204-31.htm |chapter-url= missing title (help). Parliamentary Debates (Hansard). House of Commons. 4 December 1995. col. 118. ^ "The Bradford, Kirklees and Leeds (City and Metropolitan Borough Boundaries) Order 1993". Office of Public Sector Information. 1993. Archived from the original on 6 October 2008. Retrieved 14 February 2009. 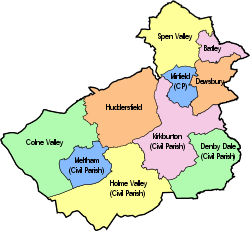 ^ "The Calderdale and Kirklees (Metropolitan Borough Boundaries) Order 1993". Office of Public Sector Information. 1993. Archived from the original on 7 September 2008. Retrieved 14 February 2009. ^ "Table KS07 religion" (PDF). Statistics. Kirklees Council. Archived from the original (PDF) on 9 June 2011. Retrieved 14 February 2009. ^ "No bypass in foreseeable future for Flockton village near M1". Huddersfield Daily Examiner. 9 July 2010. Retrieved 30 June 2017. ^ "Dewsbury Museum closes because of 'austerity cuts'". BBC News. 6 November 2016. Retrieved 29 June 2017. ^ "Library locations and opening times". Kirklees Council. September 2016. Retrieved 29 June 2017. ^ Local government in England and Wales: A Guide to the New System. London: HMSO. 1974. p. 25. ISBN 0-11-750847-0. ^ "Former Mayors". Kirklees Council. August 2008. Archived from the original on 27 February 2009. Retrieved 15 February 2009. ^ "The Mayor's Role". Kirklees Council. May 2006. Archived from the original on 5 December 2008. Retrieved 15 February 2009. ^ "Huddersfield people undecided on city status bid". Huddersfield Examiner. 9 August 2001. Archived from the original on 11 May 2008. Retrieved 14 February 2009. ^ "The Dukes and The West Riding". Regimental History. The Duke of Wellington's Regiment (West Riding)Regimental Association. 2009. Archived from the original on 6 February 2009. Retrieved 14 February 2009. ^ a b c "Freedom of Kirklees ...for a French town!". Huddersfield Examiner. 1 April 2005. Archived from the original on 22 February 2012. Retrieved 14 February 2009. ^ Hirst, Andrew (16 October 2008). "Special Huddersfield parade to honour Yorkshire Regiment". Huddersfield Examiner. Retrieved 14 February 2009. ^ a b "Kirklees Metropolitan Borough Council". Civic Heraldry of England and Wales. Retrieved 14 February 2009. ^ a b c d e f "Parish and Town Councils". Kirklees Council. January 2006. Archived from the original on 3 March 2009. Retrieved 16 February 2009. ^ a b c d "About the Council". Mirfield Town Council. 9 February 2009. Archived from the original on 21 February 2009. Retrieved 16 February 2009. ^ a b "The Councillors". Denby Dale Parish Council. 2007. Archived from the original on 25 February 2009. Retrieved 16 February 2009. ^ a b "Members of the Council". Holme Valley Parish Council. Archived from the original on 6 July 2009. Retrieved 16 February 2009. ^ a b "Kirkburton Parish Council". Kirklees Council. July 2007. Archived from the original on 13 May 2008. Retrieved 16 February 2009. ^ a b "Parish Councillors' Contact Details". Kirkburton Parish Council. 2007. Archived from the original on 5 September 2008. Retrieved 16 February 2009. ^ a b "Your members of the council". Meltham Town Council. 2008. Retrieved 16 February 2009. ^ a b c d e f "The Parliamentary Constituencies (England) Order 1995 (S.I. 1995/1626)". Office of Public Sector Information. 1995. Archived from the original on 4 July 2010. Retrieved 16 February 2009. ^ "Labour MP Jo Cox dies after being shot and stabbed in her constituency near Leeds". The Daily Telegraph. 16 June 2016. Retrieved 16 June 2016. ^ "Batley and Spen by-election: Tracy Brabin victory for 'hope and unity'". BBC News. 21 October 2016. Retrieved 20 November 2016. 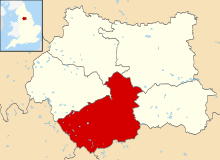 ^ a b "Batley & Spen parliamentary constituency". BBC News. Retrieved 31 March 2018. ^ a b "Batley & Spen". Political Science Resources. University of Keele. Retrieved 15 February 2009. ^ a b "Colne Valley parliamentary constituency". BBC News. Retrieved 31 March 2018. ^ a b "Colne Valley". Political Science Resources. University of Keele. Retrieved 15 February 2009. ^ a b "Dewsbury parliamentary constituency". BBC News. Retrieved 31 March 2018. ^ a b "Dewsbury". Political Science Resources. University of Keele. Retrieved 15 February 2009. ^ a b "Huddersfield parliamentary constituency". BBC News. Retrieved 31 March 2018. ^ a b "Huddersfield". Political Science Resources. University of Keele. Retrieved 15 February 2009. ^ a b "Wakefield parliamentary constituency". BBC News. Retrieved 31 March 2018. ^ a b "Wakefield". Political Science Resources. University of Keele. Retrieved 15 February 2009. ^ "United Kingdom General Election Results 1992". Political Science Resources. University of Keele. Retrieved 16 February 2009. ^ "United Kingdom General Election Results 1987". Political Science Resources. University of Keele. Retrieved 16 February 2009. ^ "United Kingdom General Election Results 1983". Political Science Resources. University of Keele. Retrieved 16 February 2009. ^ a b "United Kingdom General Election Results 1983". Political Science Resources. University of Keele. Retrieved 16 February 2009. ^ "United Kingdom General Election Results 1979". Political Science Resources. University of Keele. Retrieved 16 February 2009. ^ "United Kingdom General Election Results October 1974". Political Science Resources. University of Keele. Retrieved 16 February 2009. ^ "United Kingdom General Election Results February 1974". Political Science Resources. University of Keele. Retrieved 16 February 2009. ^ Crewe, Ivor; King, Anthony (1995). SDP: The Birth, Life and Death of the Social Democratic Party. Oxford: Oxford University Press. p. 109. ISBN 0-19-828050-5. ^ a b "United Kingdom General Election Results 1979". Political Science Resources. University of Keele. Retrieved 16 February 2009. ^ a b "United Kingdom General Election Results October 1974". Political Science Resources. University of Keele. Retrieved 16 February 2009. ^ a b "United Kingdom General Election Results February 1974". Political Science Resources. University of Keele. Retrieved 16 February 2009.